Stunning Bazaruto setting with fairytale views of the ocean, attention to detail & personal service are all 5 star. This is luxury at its best..
Azura Retreats Benguerra is definitely the most elegant, beach hotel in Mozambique, uncontested! It truly is an Island paradise! Great diving & fishing are available to the most active of guests; otherwise, relax whilst you sail on a traditional dhow or indulge yourself with a massage. The helicopter ride will get the adrenaline going for sure! The perfect Mozambique package for 2019 awaits! The island forms part of the Bazaruto Archipelago, within a Marine National Park- some 800 km north of Maputo, near the town of Vilanculos. 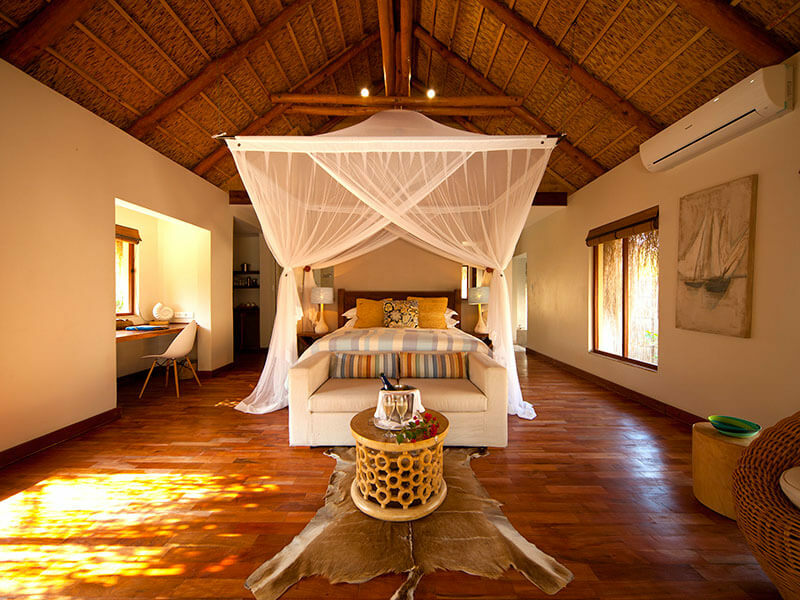 Just 20 villas are nestled along one of the last undiscovered stretches of beach in the world, Azura Benguerra Island, the first eco-friendly resort in Mozambique, was hand-built by the local community and is operated in partnership with it. Accommodation consists of two Beach Villas, 10 Infinity Villas, three Luxury Beach Villas, a Presidential Villa and the decadent Villa Amizade. Each villa was constructed entirely by hand. 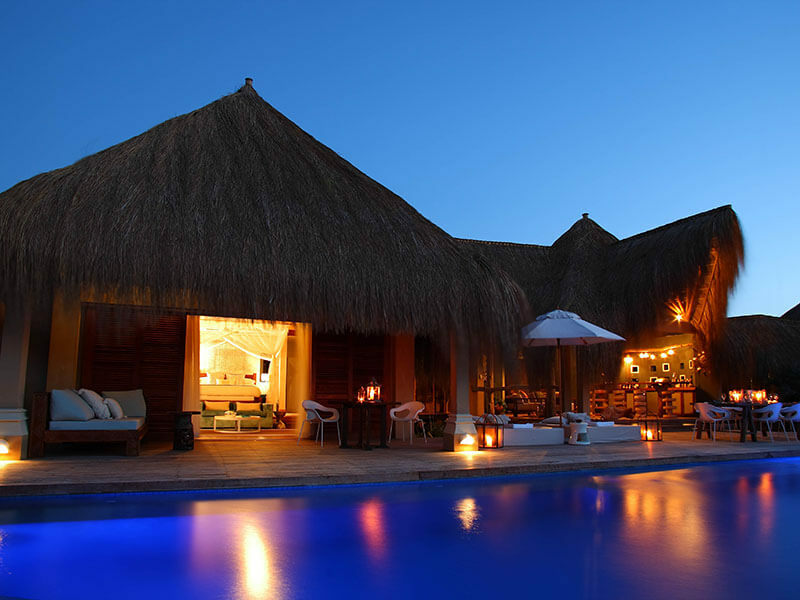 Each air-conditioned villa has its own infinity plunge pool and beachside sala, and has all the creature comforts and designer touches expected from a luxury boutique resort, set off by beautifully carved beams and traditional artwork beneath a local thatch roof. See all the room options available here. 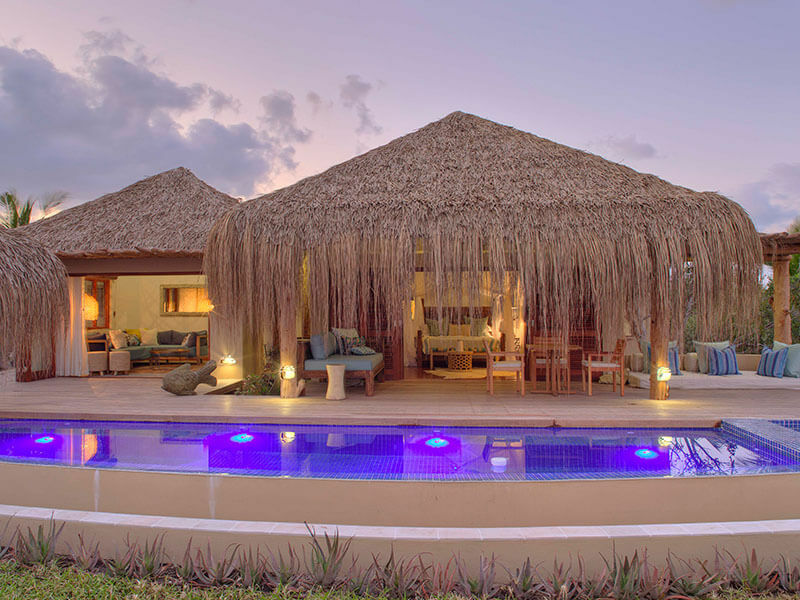 Each villa is a stone’s throw from the beach, but has been designed with privacy in mind. 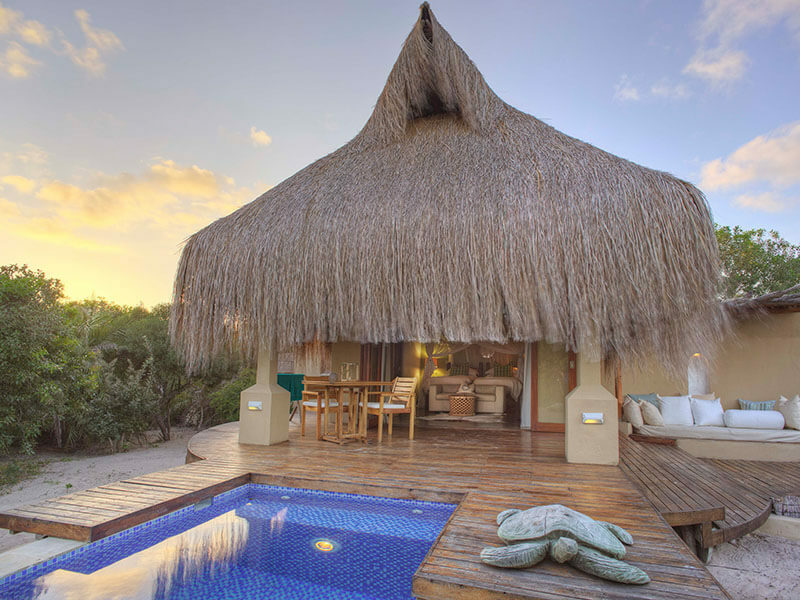 Nestled among native trees and shrubs, the villas have been carefully designed to create your own private sanctuary! The interior has extra-long king size beds, full bathroom, dressing room, minibar, international outlets, and private butler service. In addition to these facilities, Villa Amizade has 2 bedrooms, both with private bathrooms, and the Presidential Villa has 3 bedrooms, each with a private bathroom, living / dining room, larger pool and a large terrace with a Jacuzzi. 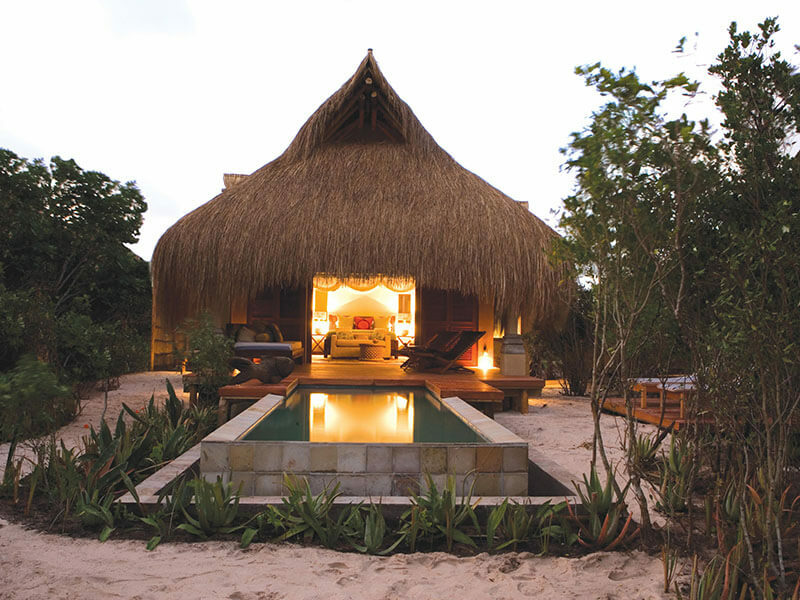 Azura Benguerra Resort is the first luxury eco-boutique retreat in Mozambique. The emphasis throughout the accommodation is on excellent service, architecture in harmony with nature and community up-lifting. 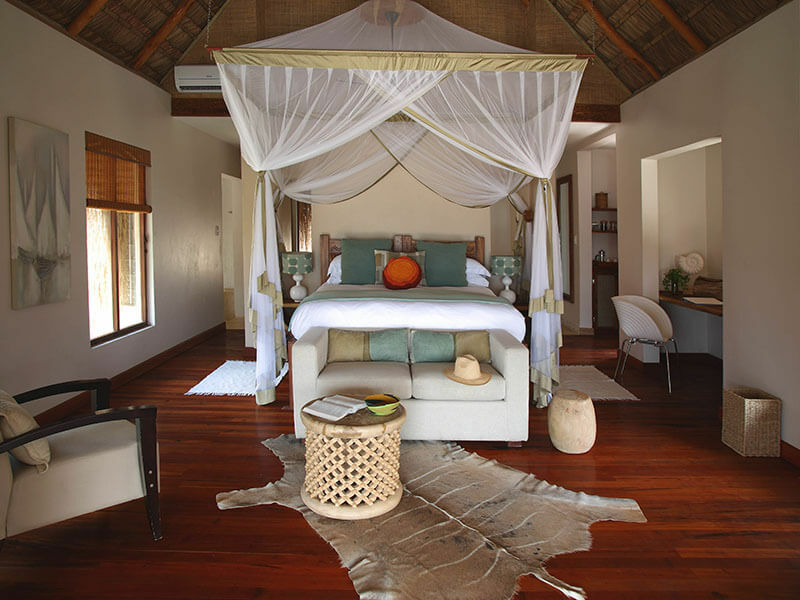 Azura Benguerra Island has just been granted Carbon Neutral Status, another first in Mozambique accommodation. The food is in the centre of Azura lodge on Benguerra Island Mozambique. The exclusive dishes of one of the best international chefs will not disappoint you, as will the vast wine cellar, with excellent wines directly from the owner’s castle in the Loire Valley in France! Local fresh Mozambican produce, most of which is homemade and locally grown, is composed with a contemporary style and touch. The refined restaurant has a beautiful unobstructed view; Gheko Deck offers informal dining in the sand, the Star Bar and a wine cellar also serving as a restaurant! The weekly highlight is the 7 course tasting dinner where the chef showcases his favourite creations. 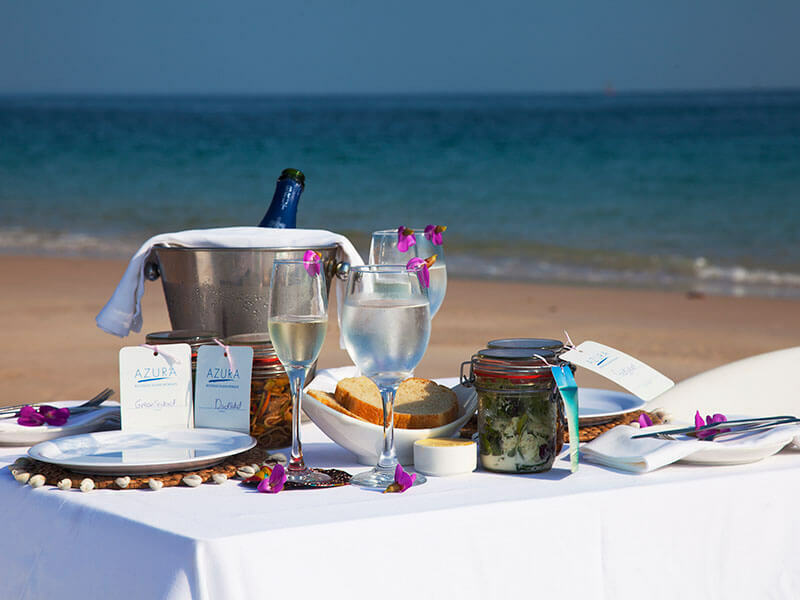 There is also a champagne brunch, candlelit dinners on the beach and picnics. Guests can also have private dinners at their villa. The main dining area offers official dinners, a lounge, and a feature stare bar. Ask your host to prepare a secluded beach picnic or a romantic candlelit beach dinner at your villa. 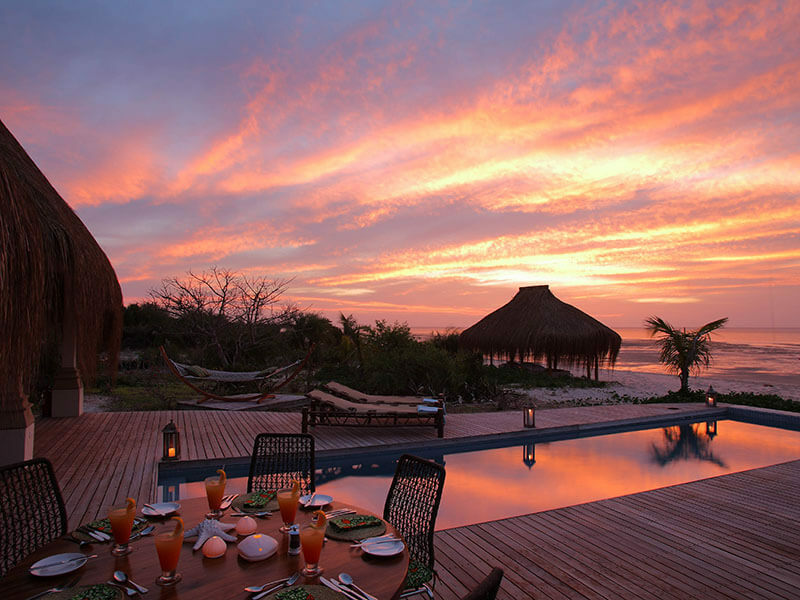 Most activities at Azura Benguerra lodge are located in and around the sea. Water sports centre offers adventures such as the Padi 5 Star dive centre with top of the range Scubapro equipment for the best scuba diving, as well as snorkelling, sailing, big game fishing and kayaking. Island drives and cultural excursions can also be arranged. Swim with dolphins, follow whales during their migration or go out with the dugong protection team in search of the shy and threatened mammal. A traditionally carved 10 meter dhow is moored offshore and available to guests at all times. View all the optional activity options and rates here for what you can do around Benguerra Island. For those who want to stay ashore, they can explore the island, climb the sand dunes or visit the island’s lakes. Discover complete privacy in your luxurious beach villa where you and your better half can feel alone in paradise! Experience brilliant personalised service, with the emphasis on subtle nuances, for the much needed romantic touches for the most magical honeymoon! Azura Benguerra Resort is offering a 40% Discount on the Bride’s accommodation for any bookings of 5 nights or more for Honeymoon couples. With Sparkling wine on arrival, a complimentary 30-minute spa treatment of your choice and in the villa return to romantic turndowns. The whole team at Azura lodge makes looking after you their priority and expect everything you could hope for in a heavenly honeymoon. With sparkling turquoise seas crisscrossed by local dhows plying their trade, sunny days and star-studded nights. This is the enchanting island escape you always imagined! And if you would like to see exactly where Azura Benguerra Island is located view our map of Mozambique here. Access to Azura Benguerra and the Bazaruto Archipelago is usually done with international flights into Vilanculous Airport. There are regular flights daily from South Africa to make your island escape easy to organize and execute. Daily flights also come in from Maputo if you wish to combine the islands with Southern Mozambique package holidays. LAM or Air Mozambique and Ethiopian Air operate one flight daily, every day of the week from Johannesburg (OR Tambo) and return. Flying time is around two hours. SA Airlink offers scheduled flights from Johannesburg International to Vilanculos on a Monday, Tuesday, Wednesday, Friday & Saturday; and flights from Nelspruit to Vilanculos daily. This allows you easy access from Kruger National Park to Mozambique. A Kruger Safari combined with a Mozambique holiday package is now easily achievable. Check with our consultants for our beach and bush packages. US Dollars, South African Rand and Mozambican Metical are accepted as currency in Mozambique.